I’ve been a Meow Cosmetics fan for a LONG time (10 years or so), but I haven’t placed an order in a while. Not sure what the reason for that was, but last month I just felt like I really missed indie brands (plus I’m really tired of boring collections that so many brands keep launching) so I decided to order something. In case you’ve never heard of Meow Cosmetics, this is a privately owned mineral-based company. 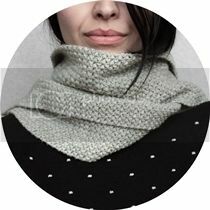 All their products are hand made. They are well known for their mineral foundation, eye shadows and blushes. They are cruelty free and many of their products are suitable for vegans, too. I placed my order during their traditional Black Friday sale when they, not only offer a 30% off code, but they also offer free international shipping (for orders over $40 or something like that – not that it’s hard to spend that much, LOL). I placed my order on 24/11 and it was shipped on 3/12. I think it took a week (or 10 days max) for the order to arrive once it was shipped. I was seriously impressed with how fast it came considering it was Black Friday! 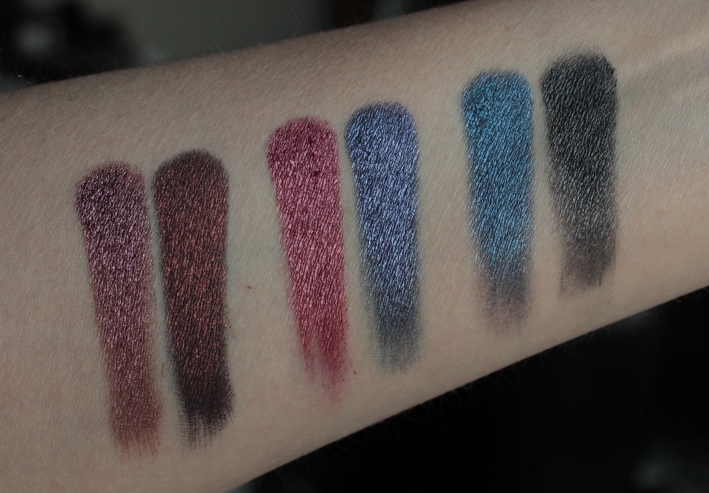 Here are my swatches (part I) and I will be swatching the rest of the shades I have on Sunday or Monday. Please note 2: all collections are vegan except for Winter Spirits collection (will be sending them an e-mail to ask which shades are vegan). Vegan collections are marked with a (V)**. Click HERE for all product information. 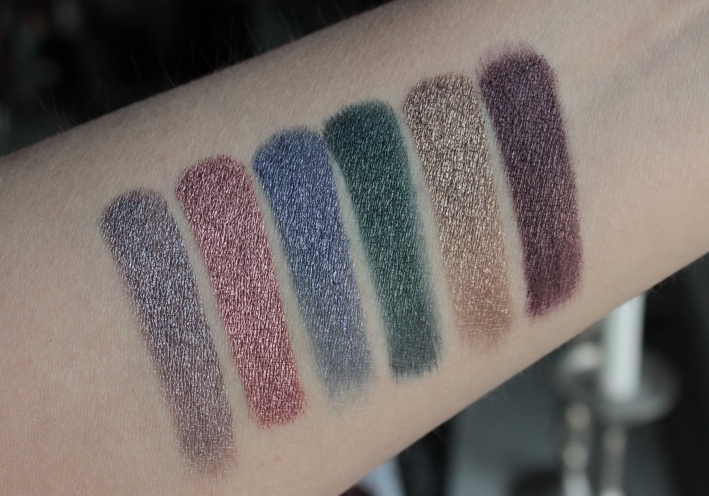 Everything was swatched with a damp Linda Hallberg 304 blending brush, no eyeshadow primer on my skin. Photos were taken in natural daylight next to a window. Pandora’s Box is a permanent collection, available all year round. It consists of 16 shades and I have 8 of them. My favorite shades are the first two – depravity and malevolence. I’m obviously into deep purple/burgundy/red shades this season! Another permanent collection. It has 14 shades and I got 12 of them. This collection has many beautiful green shades and my favorite of the bunch is deranged. Other shades I really like are morose, purpuraceous and violaceous. This is a quite small collections that consists of 3 eyeshadows and 2 blush shades. I have only eyeshadows. 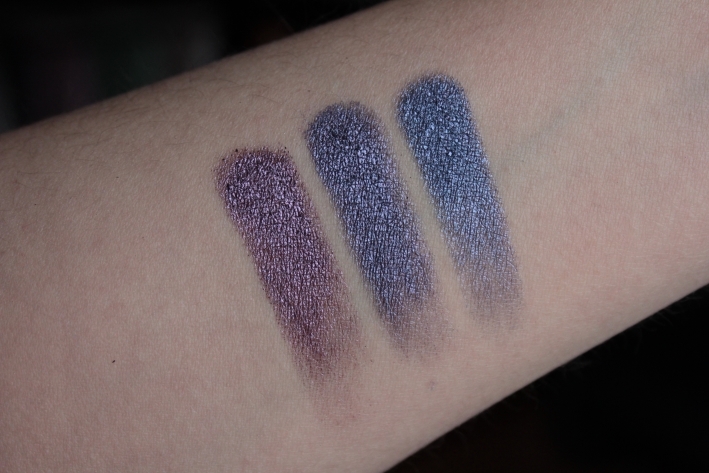 As you can see, these are gorgeous purple shades! 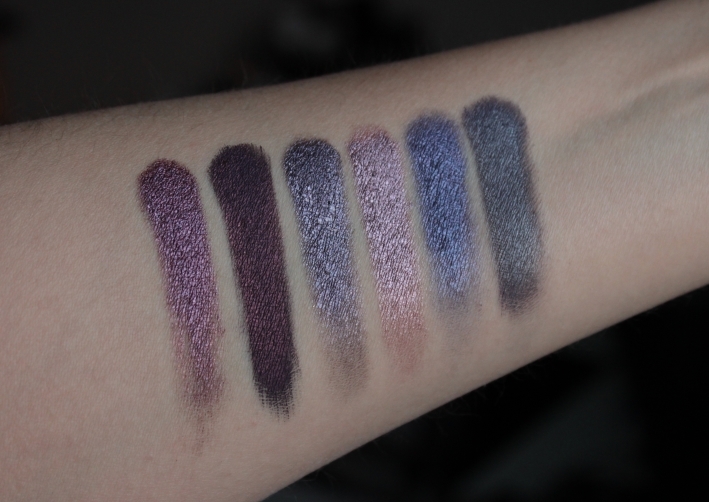 I’m really impressed wih Meow’s purple shades, they really know how to make beautiful and good purples! 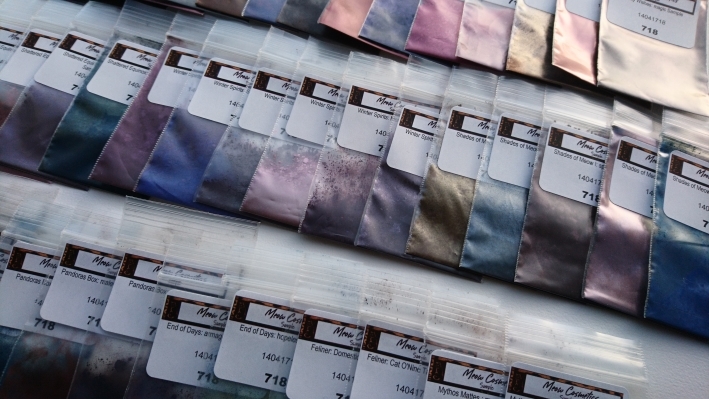 This is another permanent collection that has some really impressive shades! I think I’ll end up ordering the rest of the collection because the more I played with them, the more I loved them! I have only 5 shades, but there are 22 shades available. This collections includes 3 blush and glow (highlighter?) shades, too. All shades I got are really gorgeous and it’s hard to pick one favorite. 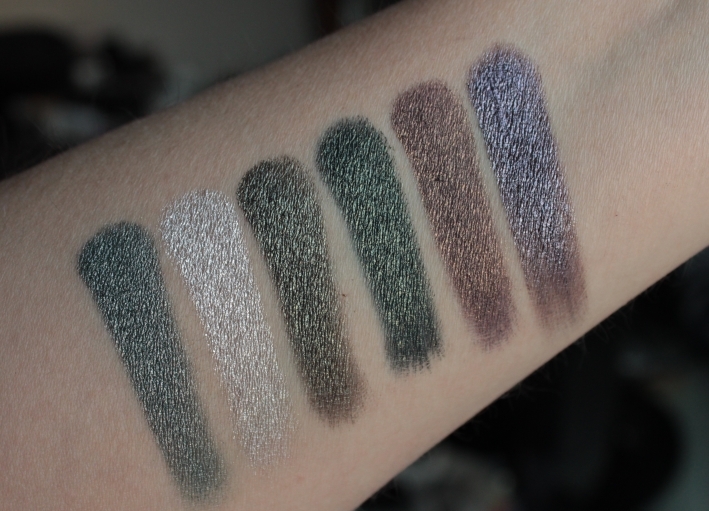 I can tell you that my least favorite is nile just because I don’t really wear silvery shades, but it’s still gorgeous looking when swatched! 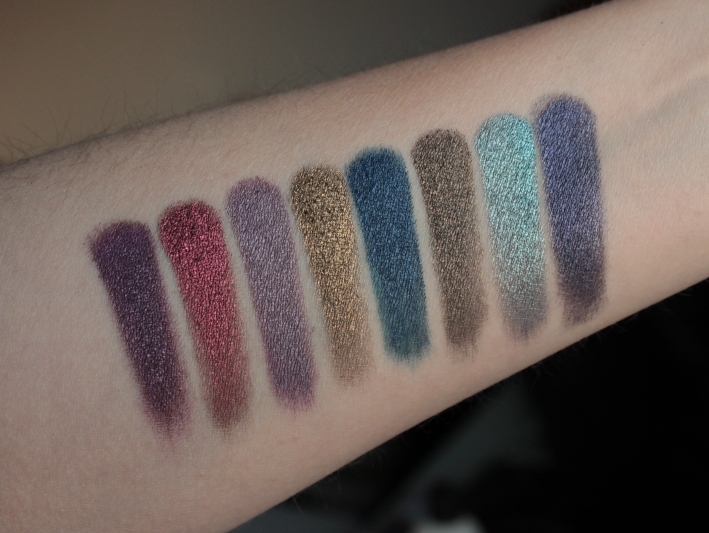 Here are some swatches of random collections. I have only 2 shades from each so I swatched them together. 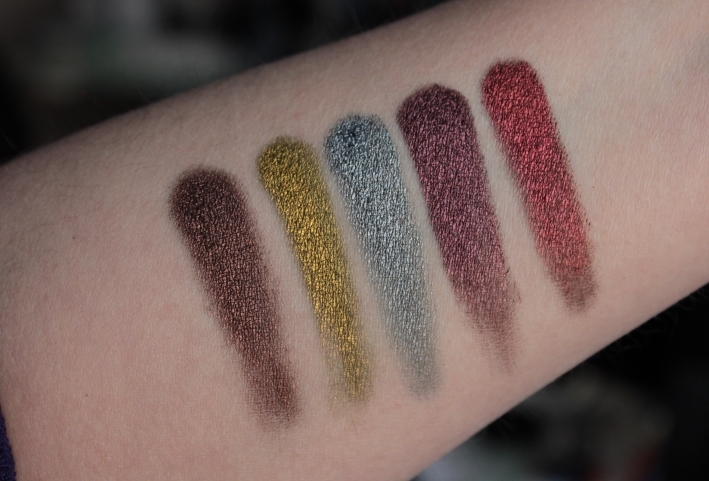 How do you like these swatches? Do you feel like you’d like to order some of them? :D Let me know in the comment section! Jako su lijepe! <3 sve su samplići? Those Shattered Equinox colors are divine. 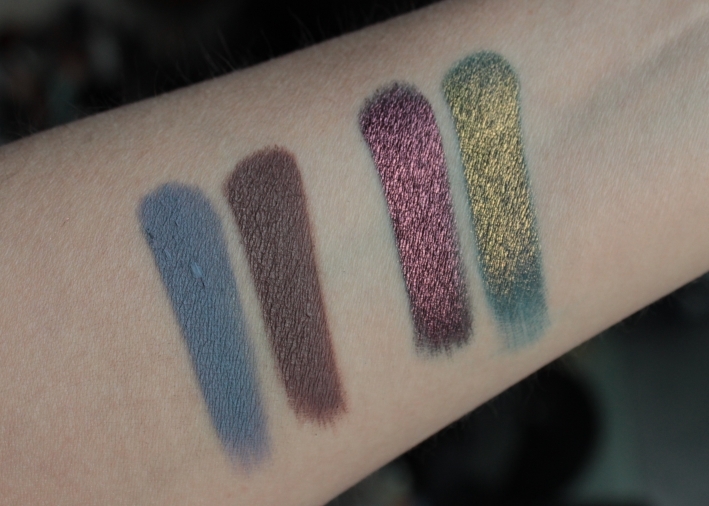 They’re the type of colors I’d wear on a normal day, but If I want to get fancy, maybe I’ll get the Sugarplum one.The nutcracker and vision shades are perfect. Lucky you to have all those swatches!